Today's burger outing took us to Koreatown in Los Angeles to sample the new Yelp superstar cheeseburger at Kalbi--It's been #1 on Yelp for a month--163 reviews and counting at the time of this post. Kalbi was in a little strip mall, and I couldn't tell you what was next to it, since the signs were not in a language that I couldn't read. 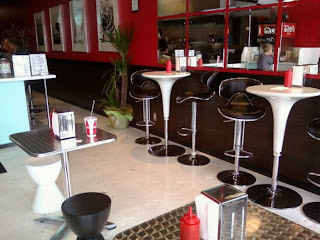 The interior was spotless and lot like a diner from the Jetsons. Kalbi/Galbi refers the style of Korean dishes prepared using rib meat, which is marinated in a mild mixture of soy, garlic, and sugar. The traditional version has a distinct flavor, which is particularly ill-suited in its sweetness for burgers. Initially, I only ordered a plain Angus cheeseburger, $6.45, but after speaking with the very polite and knowledgeable young woman at the counter, I added the signature Kalbi Burger, $8.45, to my order, since that promised to be a more interesting blend. Seriously, the staff was a pleasure to talk to. Everyone, and there were 4 of them in the small cooking and assembly area, was very pleasant and helpful. I have never encountered a staff that was so well informed about their product outside of Umami Burger. As we were packing up to leave, the owner, Hawk, even stopped by to see if I had additional questions. 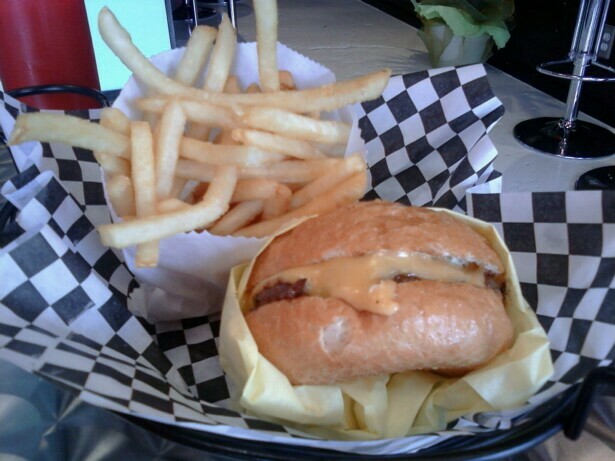 The buns were shipped in from a bakery that prepared them especially for Kalbi Burger. These buns really were the star of the dish....the best way to describe them would be a white bun with a brioche crust. Very fresh, and very moist--they handled the contents most competently. They were nicely toasted with an ideal meat to bun ratio. The beef was ground on-site, which was a good sign. They cared enough to hand prepare the cornerstone of the menu. After grinding...medium...it was just left alone and hand-pressed into firm patties as they were required. The standard burger--an 80:20 Angus chuck. 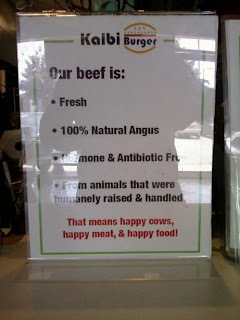 The Kalbi Burger was 50% chuck and 50% marinated rib meat (Kalbi), the fib meat was slightly fattier than the chuck. I had to assume, from the lack of funk, that the beef was wet-aged, or not aged at all. In the case of the Kalbi Burger, the rib meat did not provide the extra oomph that one looks for from that cut--the marinade cut the gaminess, which would have been welcome to butch up the insipid chuck. The burgers were assembled on the "make table" with precision and great care by a staff clearly devoted to detail. Even the relish on Happy Meal's DELICIOUS hot dog was applied with precision. 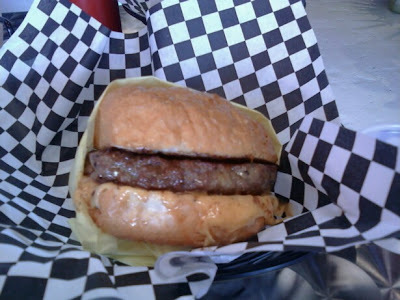 It was more like a sausage than a hot dog, and it was the best thing that we tried at Kalbi Burger. They seared the patties on a large griddle, and the sear was good and dark. They cooked the thinnish patties to a juicy Well Done. Sadly, there was no seasoning in or on the patties, so they had very little character in terms of flavor to go along with the excellent texture. In fact, the sweet kalbi marinade made its way into the standard burger, because it was baked onto the griddle--I could have done without that, since burgers are savory dishes. Some of the darkness of the sear was attributable to the caramelized sugars that coated the griddle and unfortunately sweetened the dish. The American Cheese was something akin to a very thick slice of Velveeta, and it melted down to a nacho sauce consistency when it encountered the sizzling hot patty. This gluey texture was not appropriate to the dish, and Happy Meal was not pleased. It also had that characteristic, Velveeta sweetness, which begged for some umami and salt to balance it out. 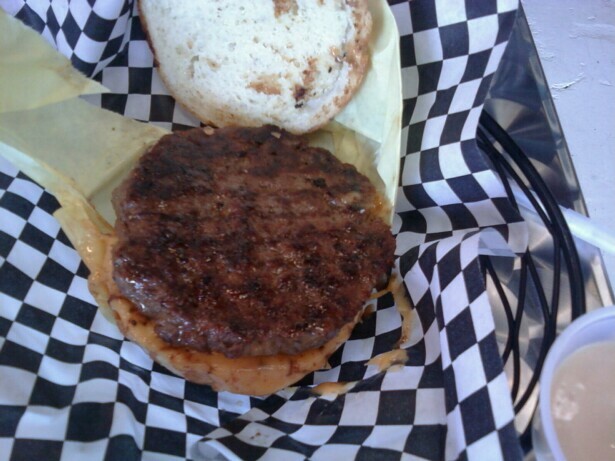 This effect was magnified in the case of the Kalbi Burger due to the sweet marinade. Too much of a bad thing. Happy Meal took one bite and spiked his burger onto the tray. He pronounced it "gross." The Value...Kalbi Burger served up generous portions, but is simply wasn't good enough. The Kalbi Burger--cheese on the bottom. At the time of this review, Kalbi had only recently opened. I imagined that they were still ironing out the kinks. This was a very precise and technically proficient burger in terms of preparation and assembly. Perhaps it catered to a regional taste, which I did not share. Were Kalbi Burger to swap out the cheese and get with the salt and pepper--hell, a little Korean soy in the grind would probably kick it up a couple of notches--then I could see this becoming something truly remarkable. The irreplaceable elements of passion and care were already in place. Frankly, all of the Korean patrons seemed very happy with their food, and Kalbi Burger may have chosen to serve that market. I didn't think to ask the owner about his target market, but due to it's Koreatown location, one could assume that the burger was tailored to Korean tastes. Burger Review : A precise, freshman effort, which may mature into a solid win if they choose to manage the flavor profile to an American palette--the skill was there, but the ingredients failed the test. At the time of this review, the cheeseburger had a long way to go to earn repeat business. This review is useless without pictures of hot Korean women.